Eyeweb allows multi-location entities to easily maintain and manage enterprise-wide safety eyewear programs . Your organization’s safety eyewear program is electronically managed ‘in the cloud’ by the Eyeweb application eliminating the time-consuming and error-prone issues associated with a manual form-based program. Your employees have access to safety eyewear 24/7 from any Internet-enable device - ANYWHERE IN THE WORLD. A single enterprise-wide solution for your organization with a proven, streamlined implementation plan. 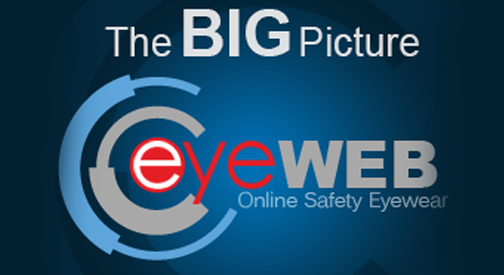 The value of EyewebSafety increases in directly proportion to the size and geographical reach of your organization – the BIGGER, the BETTER. Eyeweb is available at your convenience 24 hours a day, 7 days a week providing a consistent and high level service for all of your employees. Highly flexible Virtual Try On catalog provides your employees a wide selection of safety eyewear. Scalable to meet your needs in any environment: Large industrial facilities, remote offices, field operations, micro-centers and anything in between. Using your webcam, mobile device or file upload, add a photo to your account for virtual frame try on and patented digital measurement process. Eliminate on-site optician with our highly precise digital measurement techniques. Take a photo, upload, email, text or enter a current eyeglass prescription to your employee account. Select eyewear from the online catalog then add a lens (and options) and checkout with direct billing and/or employee co-pays. The dog ate my glasses? If your new eyewear fails to meet your expectations, simply return your eyewear with the prepaid-postage label included in your shipment and we’ll make it right. All frames are eligible for a 1-year, 1-time replacement.